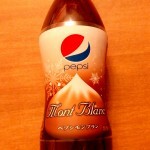 Review: Mont Blanc Pepsi | Oyatsu Break! ← Welcome to Oyatsu Break! Packaging: The package design is gorgeous. 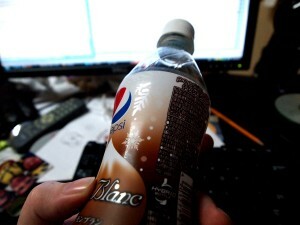 It looks sophisticated, going with a chocolatey brown and creamy white design that immediately sets it apart from garish soda packaging. 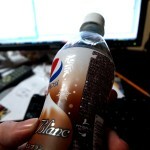 The bottle actually has SPOT VARNISH on the snowflakes! 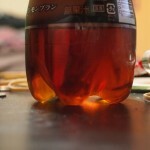 The large clear areas show off the product inside, which is notably lighter than regular Pepsi or Coke… it actually looks like strong tea. 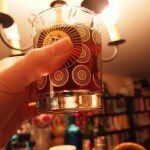 The shape is great too, resting in the hand comfortably, easy to drink. Seriously, ideal packaging for this product. Top marks. Smell: You won’t find out until you visit (or track down a really great importer), but Japanese pop bottles have a really intense POP when you crack the air-tight seal on the lid, it’s neat. 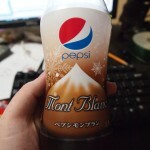 Cracking the lid on Pepsi Mont Blanc, you’re immediately hit with the scent of vanilla, and actually pretty intense at that. 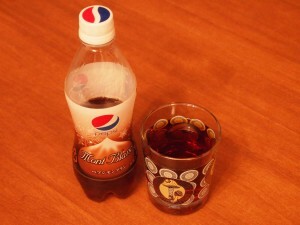 It’s followed by an earthy smell, a sort of coffee/chestnut thing, and then the unmistakable Pepsi/Coke smell follows. It’s actually really pleasant mixed altogether, a good warmup for what the beverage will taste like. Verdict: What started out in some marketing executive’s office hit the streets as a truly great, unique bottle of pop (Canadaism). 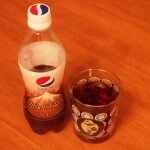 I regret that I finished my last bottle doing this review.